The month of August is the last big hurrah before we wind down the season … the lazy hazy days of summer won’t last much longer. It will soon be time to ease into our comfy sweaters and head back to school, so take advantage of every last minute! And on the holiday front, although we’ve only just recovered from Canada Day, we’re blessed with yet another long weekend. This time to celebrate the Civic Holiday. We’ll take it! Keep reading to find out more about the summer’s last big festivity, and to see what we’ve created for our tastebuds this month…something equally healthy as it is tasty. As mentioned, we have another national holiday this month, the Civic Holiday, or ‘August Long Weekend’ as we like to call it! It always falls on the first Monday of the month and it has different names depending on where you live. For example, if you’re in Nova Scotia you’ll celebrate “Natal Day”, if you’re in Newfoundland you’ll party on “Regatta Day”, and if you’re in Ontario’s capital of Toronto, you’ll enjoy “Simcoe Day”! The only certainty is that if you’re in a vehicle on your way to a campsite or cottage on any Canadian highway, you will probably be nicknaming it “The-Worst-Traffic-Jams-I’ve-Ever-Seen Day”. This month, take a health break from heaping barbecued cheeseburgers, roasted weenies and s’mores, and try our August crepe feature! 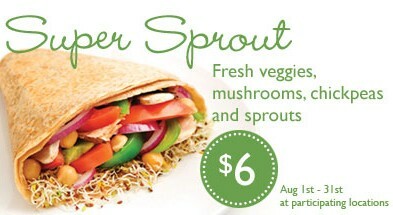 Dubbed the Super Sprout, this bundle of goodness boasts fresh veggies, mushrooms, chick peas and sprouts – it’s not only refreshing, it’s crazily good for you. We wish you all healthy eating and safe travels!